As shown by the preliminary Profiles and General Arrangements below, the MAXIMUS 196’ Flybridge Motor Yacht offers modern the very latest in European exterior styling, and luxurious Interior. 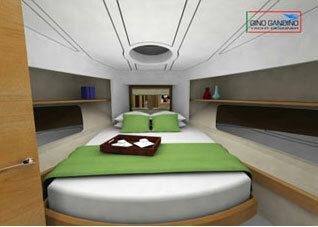 Full Ship’s Beams’ width Owners Stateroom with, large walk- in Closets. Full Kitchen with cold rooms and Central Island. 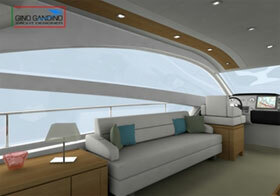 Main Lounge with Entertainment Area, Piano, large Curved Glass doors to Aft Deck. 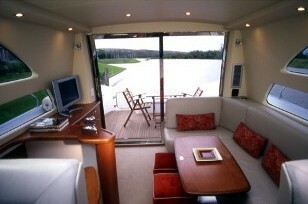 Aft Deck Large Settee with Dining Table, Stairs Down to Spa Deck and Spa, Stairs further down to Swim Platform. 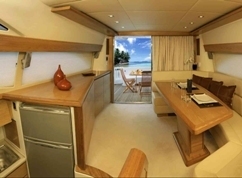 Dedicated Crews Quarters including Berths for10 crew, Living Area, ensuite heads, Galley, Circular staircase. 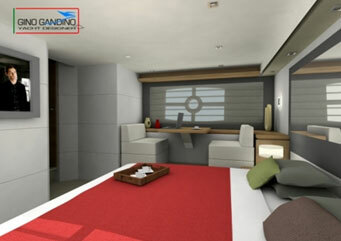 VIP Guest Stateroom (full beam with 2 full bathroom areas. Starboard Toy Garage with fold down Beach. Spa Deck with Spa, stairs down to Swim Platform. Click on PDF logo for much better detail of the photos above. Still in the early design stage, the MAXIMUS 196’ Flybridge Motor Yacht is ready for final input from its future Owner and Builder for further cosmetic details...... or OK to proceed just as she is! 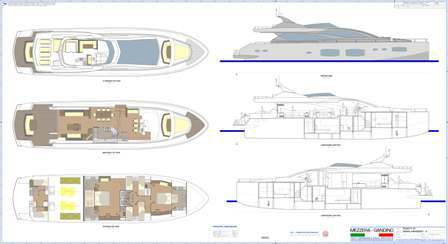 For further general information or terms regarding The 2010 MAXIMUS 196' (60m) Flybridge Motor Yacht design package, please contact us by e mail or fax. To meet the ever increasing demand for new Yacht Designs in excess of 100' YCA (HK) Ltd. is pleased to offer another great design by Gino Gandino Yacht Design (Italy). 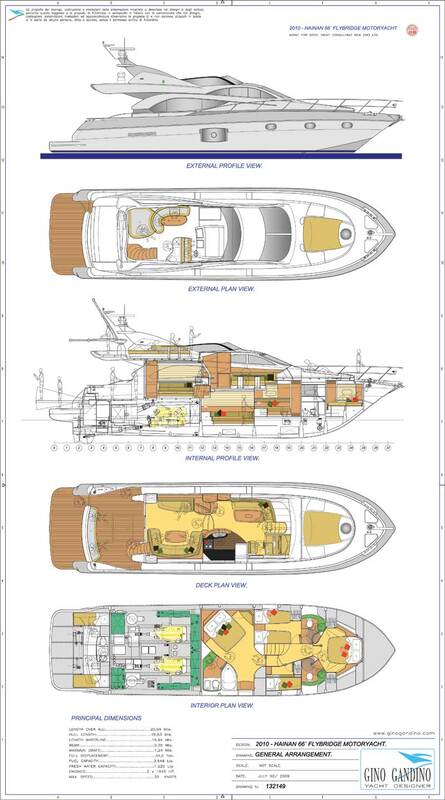 As you can see by the preliminary General Arrangements below, the Macao 112' Tri-Deck Motor Yacht offers modern European Styling, a Great preliminary view to a well thought out Interior Arrangement. 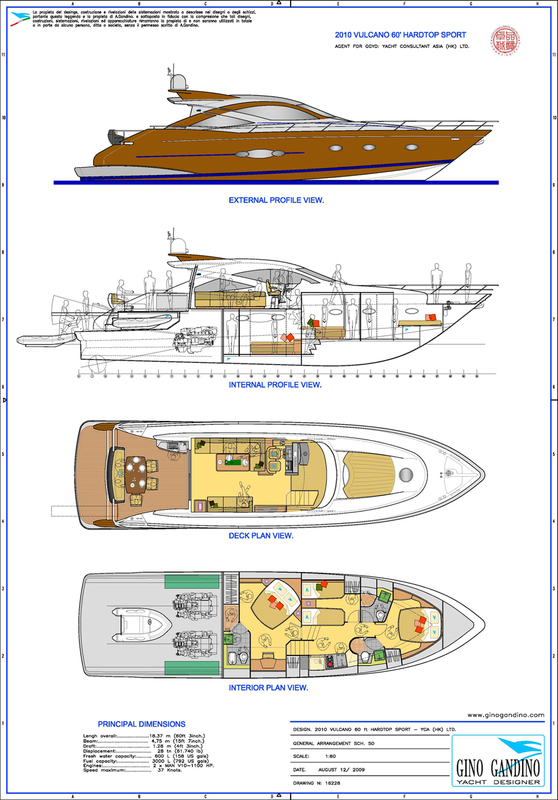 We will work closely with owner of this drawing package to provide the best Yacht to suit your Client' needs, offering the maximum opportunity in cosmetic design and equipment selection. This design package will require 8-9 months to complete, offering the buyer maximum imput from a cosmetic design and equipment selection opportunity. Still in the preliminary design stage, the Macao 112' Tri-Deck Motor Yacht awaits final input from its future builder for some cosmetic details, or the OK to proceed as is! 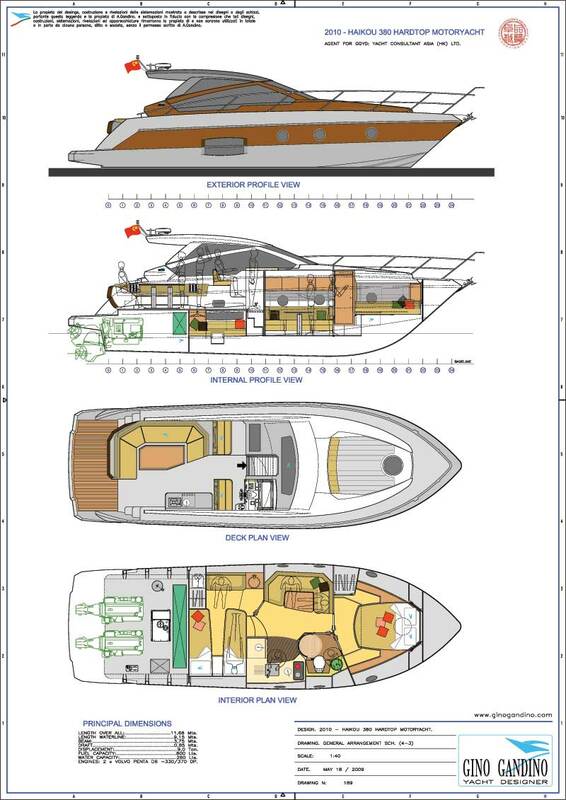 For further general information or terms regarding EXCLUSIVE ownership of The Macao 112'Tri-Deck Motor Yacht design package, please contact us by e mail or fax. Sister to the Macao 112', this vessel is also designed by Gino Gandino Yacht Design (Italy), to meet the ever increasing demand for new Yacht Designs in excess of 100'. 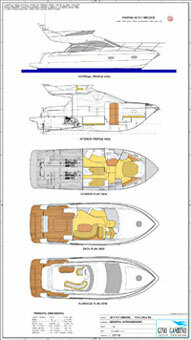 In addition, it can fill out your Yacht product line to meet the varying needs of your clients. 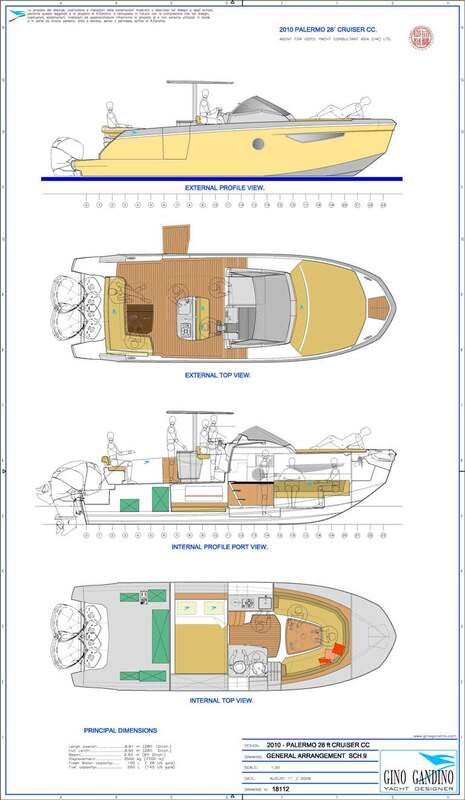 As you can see by the preliminary General Arrangements below, the Shenzhen 107' Tri-Deck Motor Yacht offers modern European Styling, a Great preliminary view to a well thought out Interior Arrangement. We will work closely with owner of this drawing package to provide the best Yacht to suit your Client' needs, offering the maximum opportunity in cosmetic design and equipment selection. This design package will require 8-9 months to complete. Still in the design stage, the Shenzhen Tri-Deck Motor Yacht awaits final input from its future builder for some cosmetic details, or the OK to proceed as is! 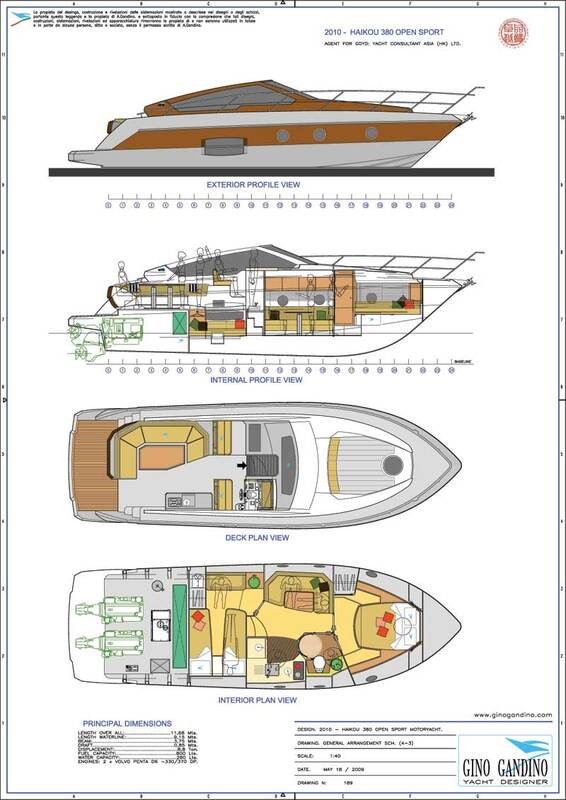 For further general information or terms regarding EXCLUSIVE ownership of The Shenzhen 107'Tri-Deck Motor Yacht design package, please contact us by e mail or fax. 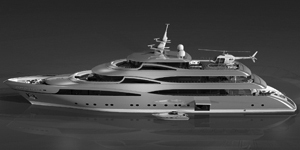 YCA (HK) Ltd. is pleased to offer this remarkable new design by the Gino Gandino Design Team. 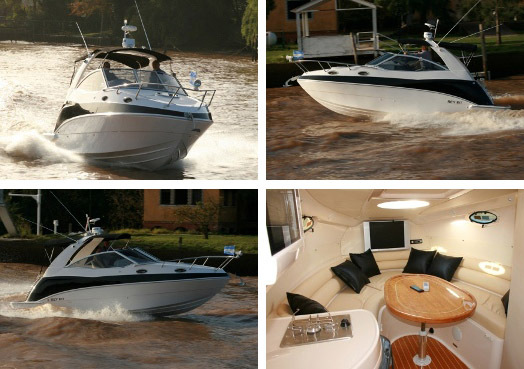 As you can see by the Profiles and General Arrangement Options below, the CAPRI 95’ design package offers modern European Styling and luxurious comfort simultaneously. 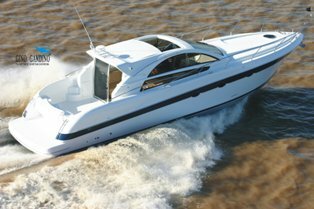 Based on the successful Marco Polo 85’, the 2010 Capri 95’ offers creative use of a much larger interior space, adding a well thought out permanently covered Flybridge Arrangement. We feel this vessel is perfectly suited for the Middle East Gulf and south Asian seas. This drawings package offers a very high level of detail that that will “fast forward” your production and Marketing abilities. 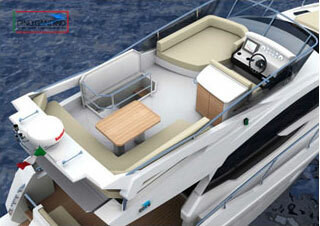 Roomy Flybridge area featuring a Hard Top Bimini Top, Dining settee and table for 8-10, large Tanning bed, Nav. table at the double upper Helm station. 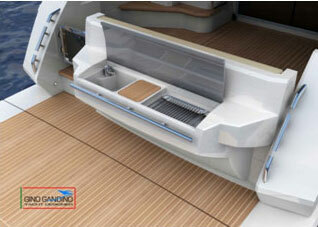 Large Tanning bed on foredeck. Fore Deck U shaped Settee. Roomy dining settee with Hi/Low table, Stbd. 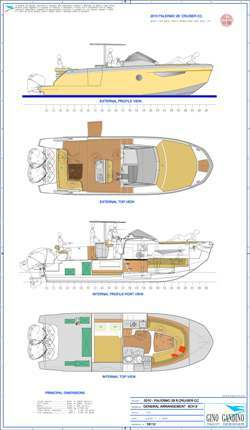 side Settee, Galley and Helm Station located on the main deck. 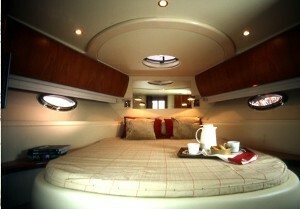 A large ensuite Master Stateroom. VIP Ensuite Stateroom located forward. 2 Inter. General Arrangements to choose from. 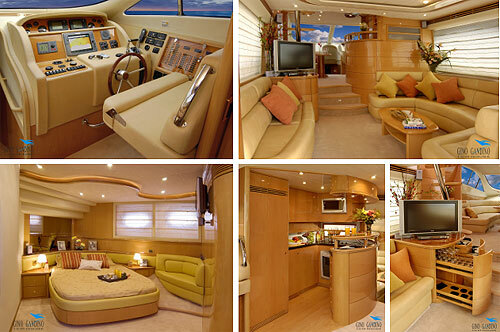 Large Exterior Settee and Dining accommodations for 6-8, located on the aft deck. Still in the design stage, the CAPRI 95’ awaits final input from its future builder for some cosmetic details, or the OK to proceed as is! This base design package can be completed within 6 months and ready to start mould buildings and market upon the purchasing contract is signed. 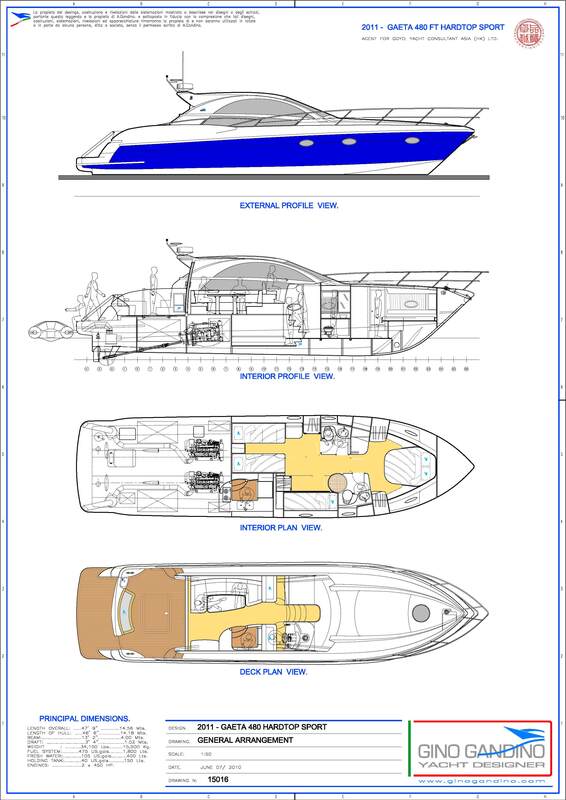 For further general information or terms regarding EXCLUSIVE ownership of CAPRI 95’ Fly Bridge Motor Yacht design package, please contact us by email or fax. YCA (HK) Ltd. is pleased to offer a very special design by Gino Gandino’s Design Team, in Buenos Aries. 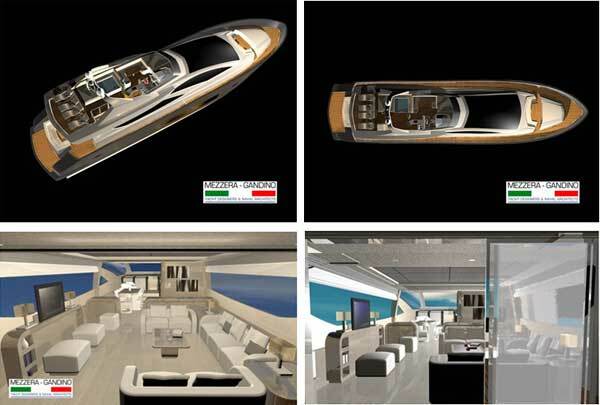 As you can see by the preliminary General Arrangements and Renderings below, the 27m design package, offers “state of the art” modern European Styling, with well thought out Interior Arrangements… in Standard 2 versions, with the ability to create custom arrangements and specific equipment selections, at your request. Although the complete design package will require 6-8 months to complete, lines and tooling detail can be available very soon, thereby “fast forwarding” your Production and Marketing abilities. 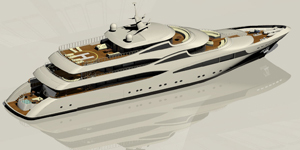 Still in the design stage, the PROGRETTO 270 Meter awaits final input from its future builder for some cosmetic details, or the OK to proceed as is in either Standard Version. For further general information or terms regarding GLOBAL EXCLUSIVITY of the 2012-PROGRETTO 270 Motor Yacht design, please contact us by e mail or fax. 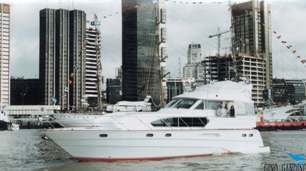 The Marco Polo 85' (26.15 meter) FRP Motor Yacht. 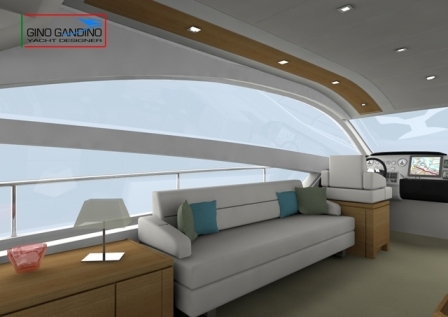 As a collaborative effort between Yacht Consultants Asia (HK) Ltd. and Gino Gandino Yacht Design (Italy), we offer a complete Yacht design package, designed and engineered to RINA Standard. This "turnkey" design and engineering package, represents a valuable opportunity to any yacht manufacturing company or individual, seriously interested in developing or increasing a high quality YACHT product line. The package is available now, allowing you to start marketing, estimating, procurement and production immediately. Sleek Italian styling combined with high performance. Designed for Twin MTU or MAN Engines or optional modification for CAT. 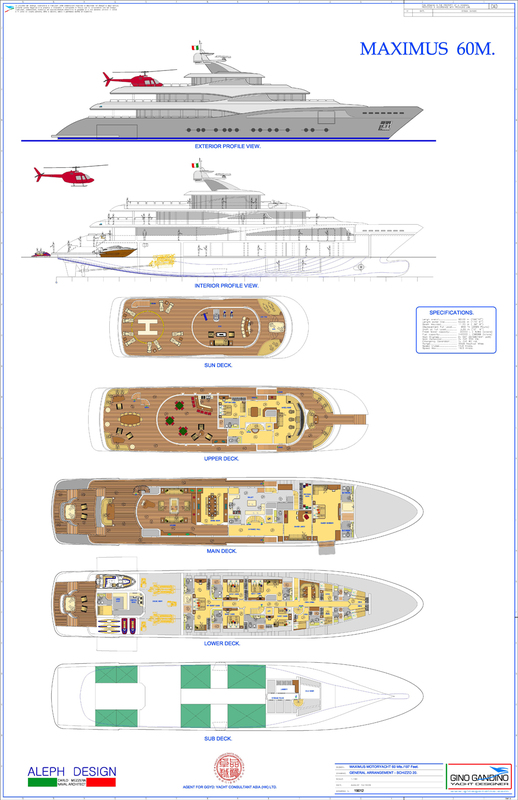 Over 145 AutoCAD Drawings available on CD-Rom, ready for your plotter. 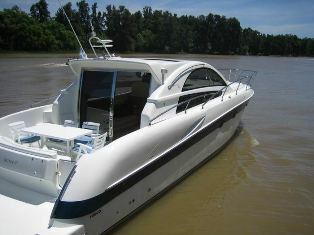 .9 meter (1:24) scale, professionally built FRP Yacht Model included. EXCLUSIVE ownership of this design is available, as an Option. 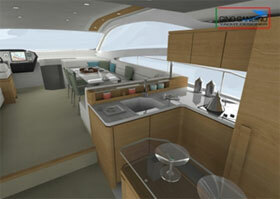 Ongoing support from Yacht Consultants Asia (HK) Ltd and Gino Gandino Yacht Design (Italy) is available, as an Option. For further information or terms regarding EXCLUSIVE or Non Exclusive ownership of this splendid design package, please contact us by e mail or fax. YCA (HK) Ltd. is pleased to offer another great design by Gino Gandino’s Design Team, in Buenos Aries. 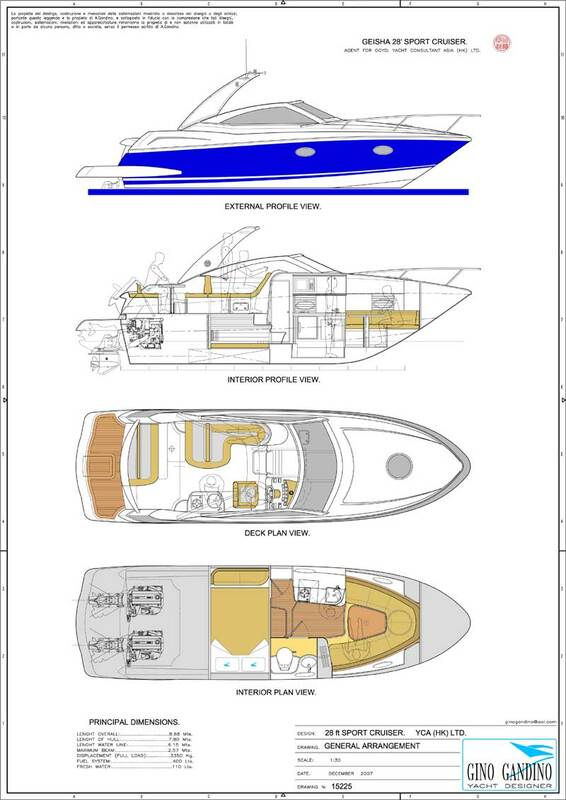 As you can see by the preliminary General Arrangements and Renderings below, the Pescara 71’ design package, offers modern European Styling, a well thought out Interior Arrangement, and tooling detail that will “fast forward” your production and Marketing abilities. This design package will require 5-6 months to complete, but offers the maximum in a cosmetic design and equipment selection opportunity, for the buyer. Still in the design stage, the Pescara 71’ awaits final input from its future builder for some cosmetic details, or the OK to proceed as is! 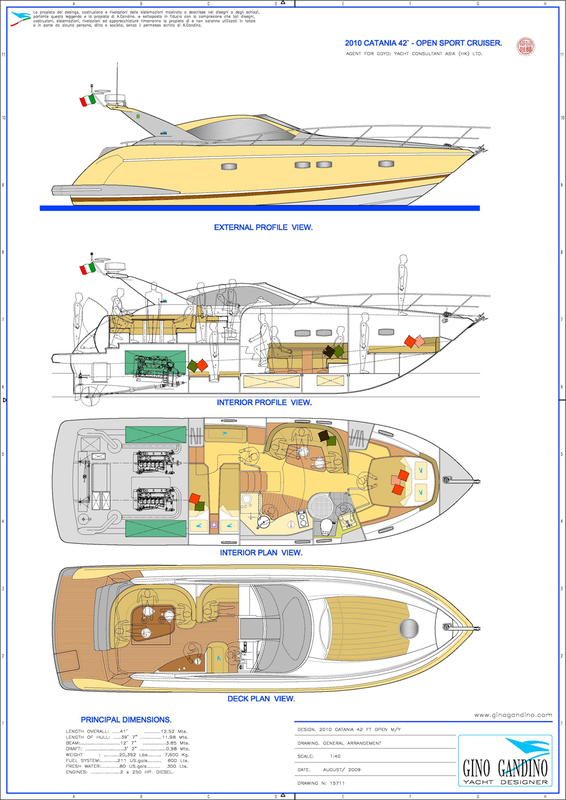 For further general information or terms regarding EXCLUSIVE ownership of 2011-Pescara 710 Convertible Motor Yacht design package, please contact us by e mail or fax. YCA (HK) Ltd. offers another great EURO design by Italian Designer Gino Gandino. 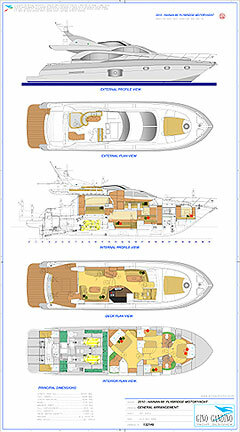 As you can see by the General Arrangements and Renderings below, the Hainan 66’ (20.04 meter) Flybridge Motor Yacht design package, offers modern European Styling, a well thought out Interior Arrangement, and tooling detail that will "fast forward" your production and Marketing abilities. This updated design package is complete and ready to start marketing, procurement and tooling, unless the buyer requires changes. As two Yachts of similar earlier versions of this design are launched and in service in the Dubai area, with a 3rd under presently under construction… we know it’s popular even in the most demanding and competitive market! The 2010 Hainan 66’ (20.04 meter) Flybridge Motor Yacht should be seriously considered, if starting a new product line or adding to your existing line of quality Yachts, being sold in Asia or abroad. 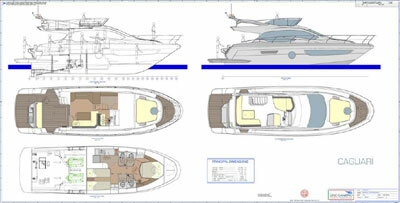 This design package comes completed and ready for Yacht planning and production now. 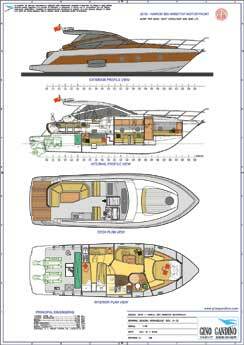 For further general information or terms regarding OPEN or EXCLUSIVE ownership the Hainan 66’ (20.04 meter) Flybridge Motor Yacht design package, please contact us by e mail or fax. 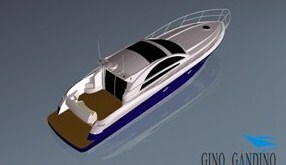 YCA (HK) Ltd. is exited to offer another new design by Italian Gino Gandino Design Team, located in Buenos Aries. 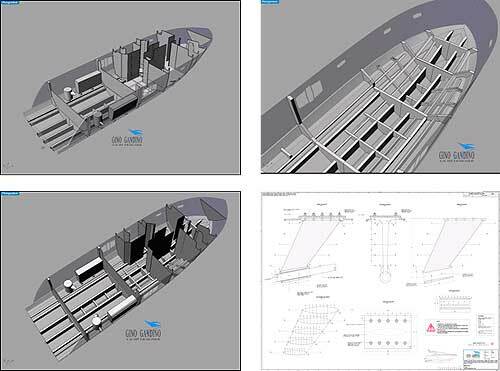 As you can see by the preliminary General Arrangements and Exterior/Interior Renderings below, the 62ft design package, offers modern European Styling, a well thought out Interior Arrangement, and tooling detail that will “fast forward” your production and Marketing abilities. This design package will require 1 months to complete, but offers the maximum in a cosmetic design and equipment selection opportunity, for the buyer. We will have the complete design package of the IMPERIA ready for your turn-key production when within 1 month to translate the file from Italian / Spanish to English. 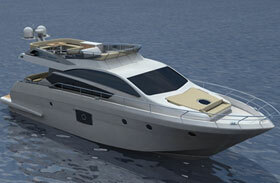 For further general information or terms regarding IMPERIA 62 Flybridge Motor Yacht, please contact us by email or fax. YCA (HK) Ltd. is pleased to offer another great design by Gino Gandino’s Design Team, in Buenos Aries. 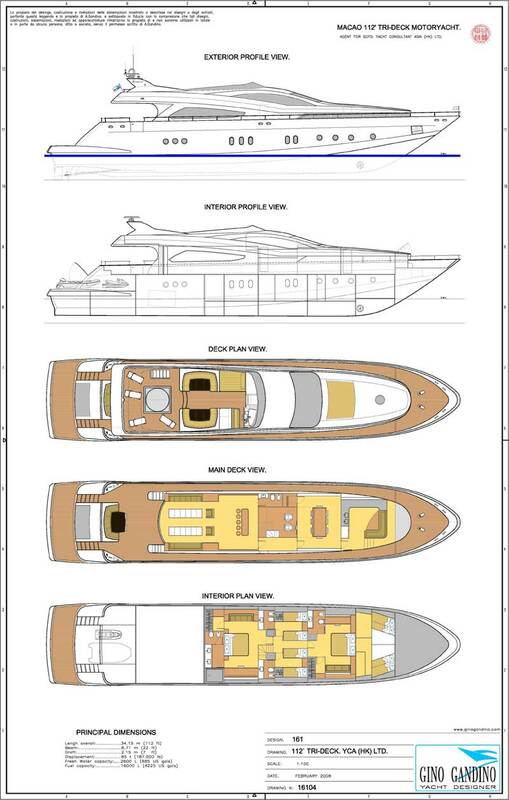 As you can see by the preliminary General Arrangements and Renderings below, the Pescara 61’ design package, offers modern European Styling, a well thought out Interior Arrangement, and tooling detail that will “fast forward” your production and Marketing abilities. Still in the design stage, the Pescara 61’ awaits final input from its future builder for some cosmetic details, or the OK to proceed as is! 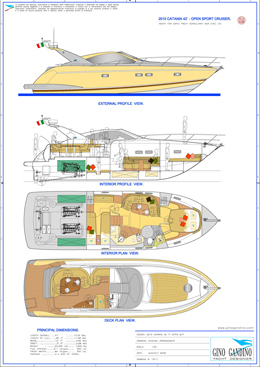 For further general information or terms regarding EXCLUSIVE ownership of 2011-Pescara 610 Convertible Motor Yacht design package, please contact us by e mail or fax. 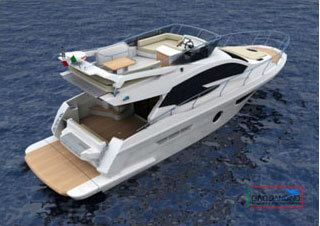 YCA (HK) Ltd. is pleased to offer this great new design by Italian Gino Gandino Yacht Design. 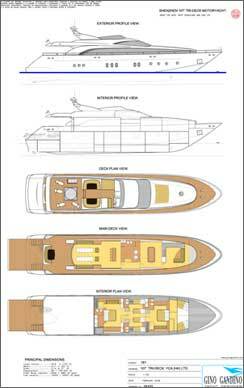 As you can see by the preliminary Profiles and General Arrangements below, the VULCANO 60’ Hardtop Sport Yacht offers modern the very latest in European Styling, a well thought out Interior Arrangement with the emphasis placed on eligance and performance. 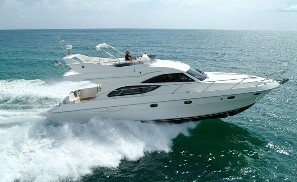 Big and realiable twin Man Diesel engines developing over 2200HP create a top speed of over 37knots. GGYD’s design quality and detail will “fast forward” your production and Marketing abilities. Salon up with L shaped Settee and Hi/Lo Table on Port side. 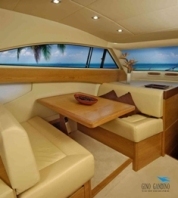 Large settee/table and wet bar with electric barbecue/wet bar and dining area on aft deck. 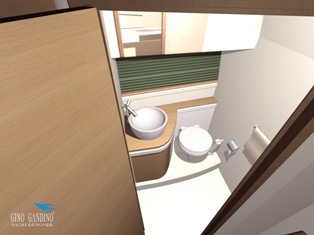 Full width ensuite Owners Stateroom with hanging locker and vanity/desk. 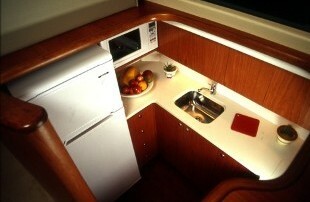 Well equipped Galley on Starb.side. 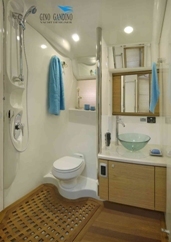 Double berth guest stateroom next to full washroom and shower. Still in the preliminary design stage, the Vulcano 60’ Hardtop Sport Yacht would enjoy final input from its future builder for some branding or cosmetic details, or the OK to proceed just as she is! For further general information or terms regarding EXCLUSIVE use of The 2010 Vulcano 60'(18.37m)Hardtop Sport design package, please contact us by e mail or fax. 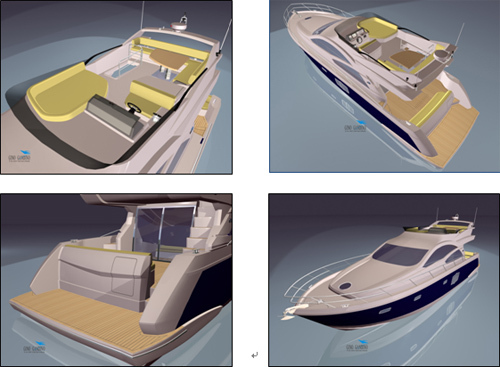 Still in the preliminary design stage, the Varese 58’ Flybridge Motor Yacht would enjoy final input from its future builder for some branding or cosmetic details, or the OK to proceed just as she is! 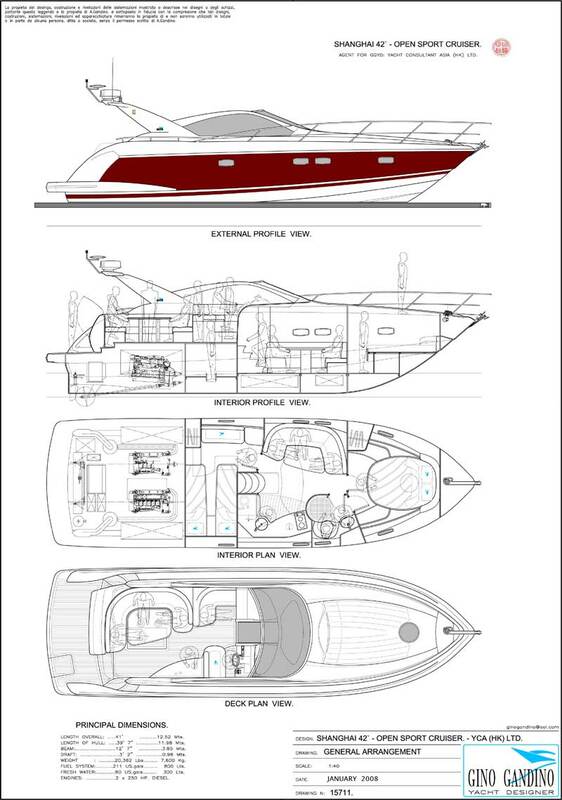 For further general information or terms regarding EXCLUSIVE use of The 2010 Varese 58' (17.78m) Flybridge Motor Yacht design package, please contact us by e mail or fax. 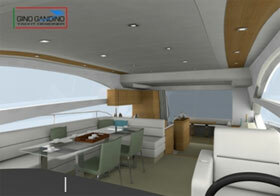 YCA (HK) Ltd. is pleased to offer another great design by Gino Gandino Yacht Design (Italy). 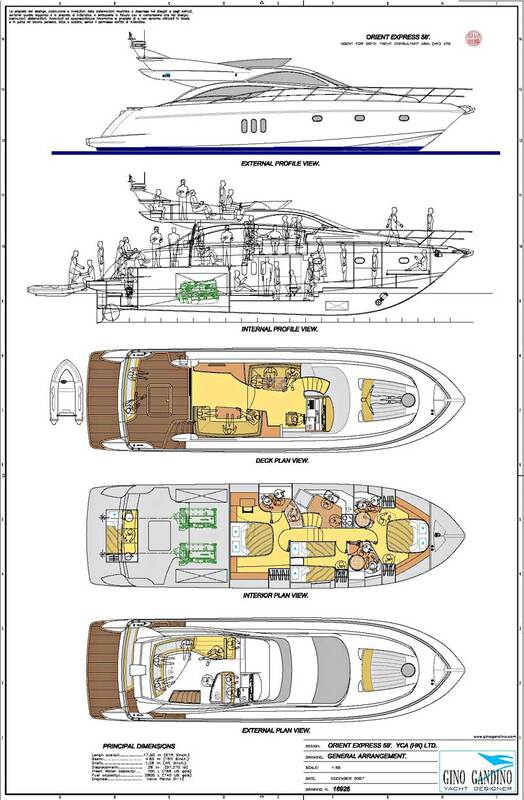 As you can see by the preliminary General Arrangements and Renderings below, the Orient Express 58' design package, offers modern European Styling, a well thought out Interior Arrangement, and tooling detail that will "fast forward" your production and Marketing abilities. This design package will require 6-7 months to complete, but offers the maximum in a cosmetic design and equipment selection opportunity, for the buyer. 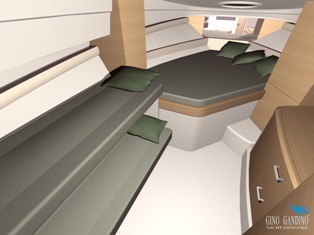 Still in the design stage, the Orient Express 58' awaits final input from its future builder for some cosmetic details, or the OK to proceed as is! 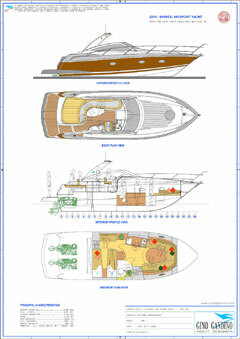 This design package can be completed and ready for Yacht production within 6-7 months. 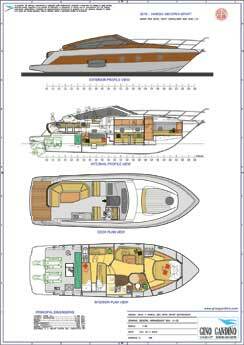 For further general information or terms regarding EXCLUSIVE ownership of Orient Express 58' Fly Bridge Motor Yacht design package, please contact us by e mail or fax. 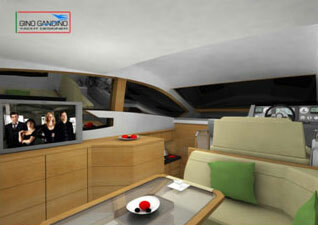 YCA (HK) Ltd. is pleased to offer another great design by Gino Gandino Yacht Design (Italy). 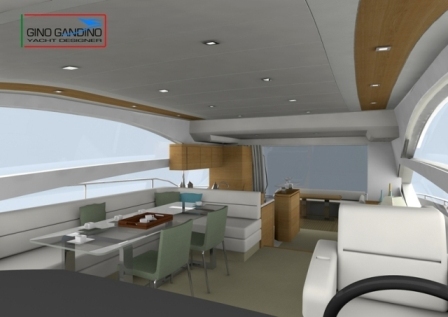 As you can see by the preliminary General Arrangements and Renderings below, the SanYa 55' design package, offers modern European Styling, a well thought out Interior Arrangement, and tooling detail that will "fast forward" your production and Marketing abilities. This design package will require 1-2 months to complete, but offers the maximum in a cosmetic design and equipment selection opportunity, for the buyer. Still in the design stage, the SanYa 55' awaits final input from its future builder for some cosmetic details, or the OK to proceed as is! 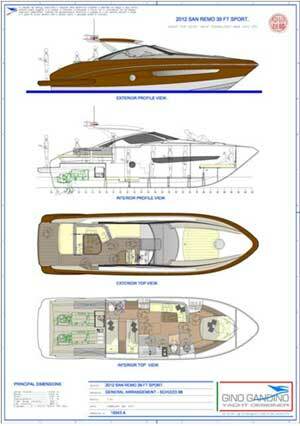 This base design package can be completed and ready to start Yacht production within 1-2 months. 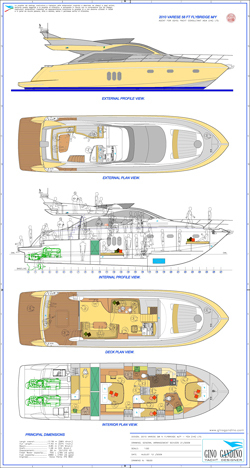 For further general information or terms regarding EXCLUSIVE ownership of SanYa 55' Fly Bridge Motor Yacht design package, please contact us by e mail or fax. YCA (HK) Ltd. is pleased to offer another great design by Gino Gandino’s Design Team, in Buenos Aries. 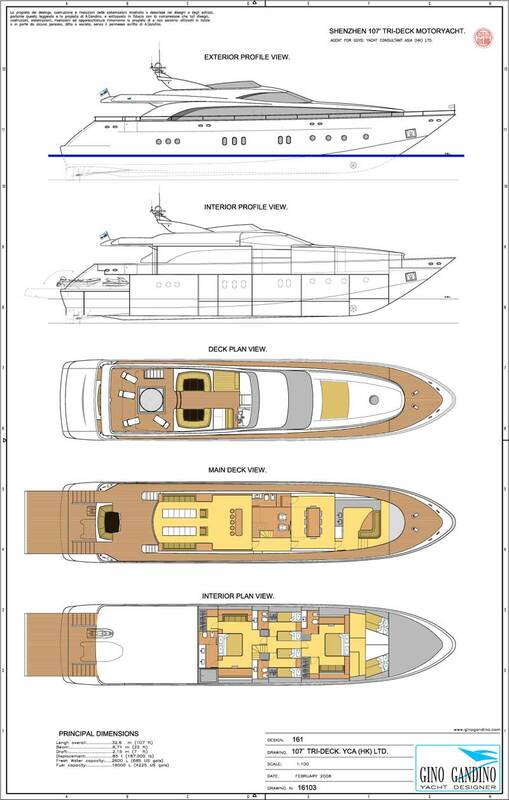 As you can see by the preliminary General Arrangements and Renderings below, the Vesubio 52’ design package, offers modern European Styling, a well thought out Interior Arrangement, and tooling detail that will “fast forward” your production and Marketing abilities. Still in the design stage, the Vesubio 52’ awaits final input from its future builder for some cosmetic details, or the OK to proceed as is! 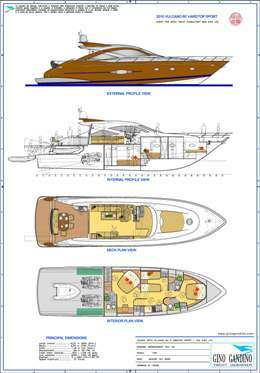 For further general information or terms regarding EXCLUSIVE ownership of The-Vesubio 52'After Cabin design package, please contact us by e mail or fax. YCA (HK) Ltd. is pleased to offer another great design by Gino Gandino’s Design Team, in Buenos Aries. 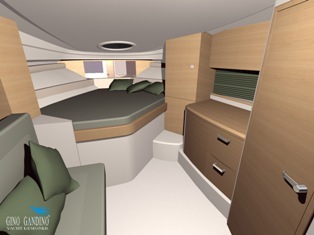 As you can see by General Arrangements and Renderings below, the Ravenna 50’ design package, offers modern European Styling, a well thought out Interior Arrangement, and tooling detail that will “fast forward”your production and Marketing abilities. This design package will require 1 month to complete translation from Italy / Spain to English, but offers the maximum in a cosmetic design and equipment selection opportunity, for the buyer. We will have the complete design package of the Ravenna 50' ready for your turn-key production within 1 month to translate the file from Italian / Spanish to English. 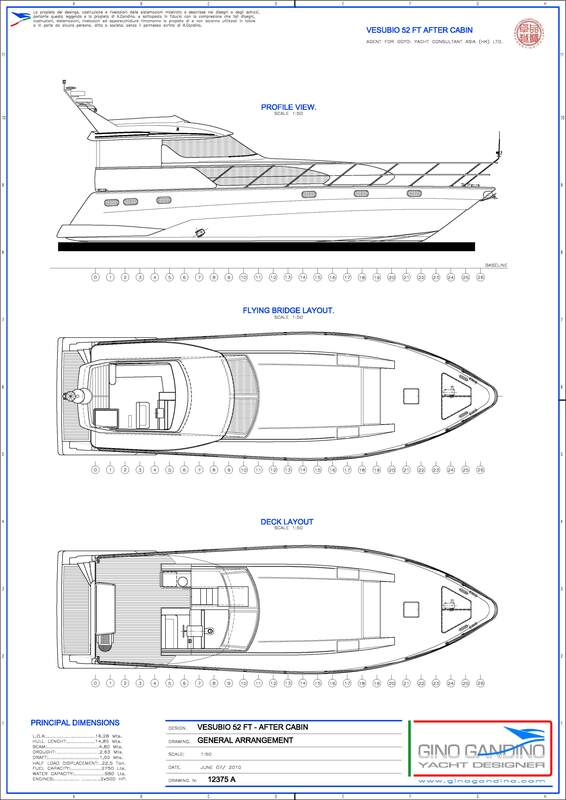 For further general information or terms regarding Ravenna 50' Flybridge Convertible Motor Yacht design package, please contact us by e mail or fax. YCA (HK) Ltd. is pleased to offer another great design by Gino Gandino’s Design Team, in Buenos Aries. 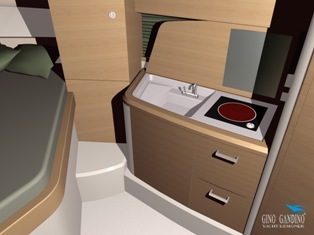 As you can see by the preliminary General Arrangements and Renderings below, the Gaeta 480 design package, offers modern European Styling, a well thought out Interior Arrangement, and tooling detail that will “fast forward” your production and Marketing abilities. 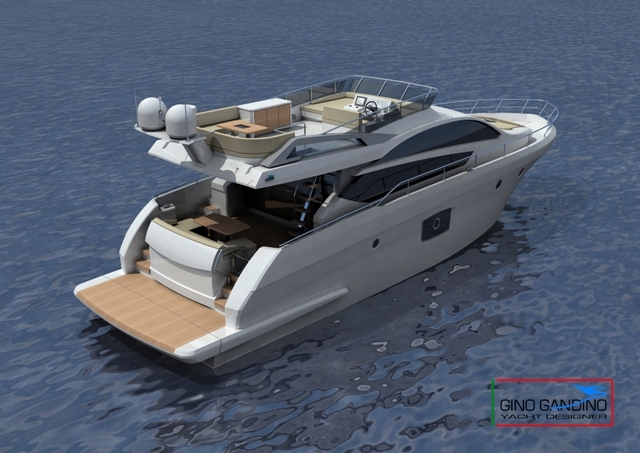 Still in the design stage, the Gaeta 480 awaits final input from its future builder for some cosmetic details, or the OK to proceed as is! 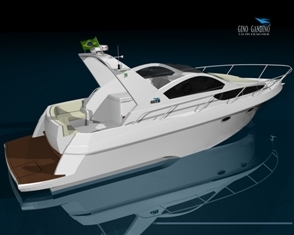 For further general information or terms regarding EXCLUSIVE ownership of 2011-Gaeta 480 Hardtop Sport design package, please contact us by e mail or fax. 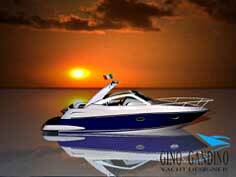 YCA (HK) Ltd. is pleased to offer this great new design by the Gino Gandino Design Team. 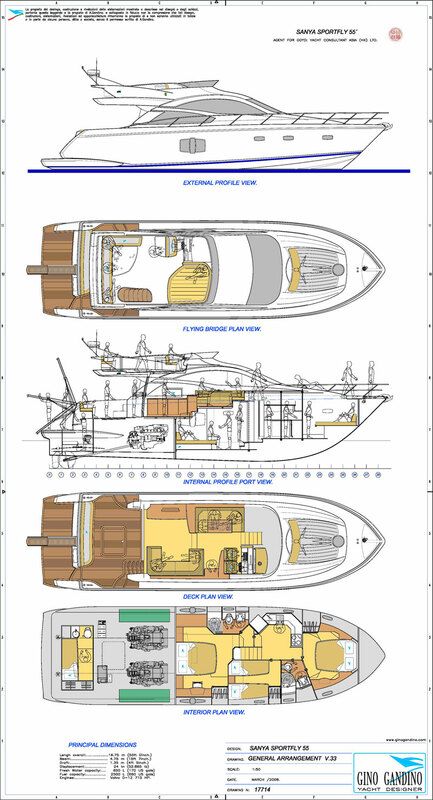 As you can see by the preliminary General Arrangements and Renderings below, the CARRARA 47’ design package offers modern European Styling, a well thought out Interior Arrangement, and tooling detail that will “fast forward” your production and Marketing abilities. 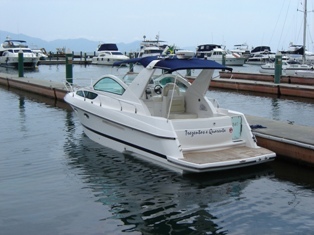 Roomy Flybridge area with L shaped settee, large Tanning bed, Nav. table at upper Helm station. 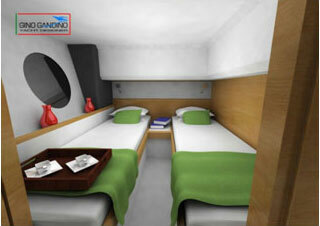 2 double bunk Staterooms sharing Head with shower. Step down Galley on the accommodation deck. Still in the design stage, the CARRARA 47’ awaits final input from its future builder for some cosmetic details, or the OK to proceed as is! For further general information or terms regarding EXCLUSIVE ownership of CARRARA 47’ Fly Bridge Motor Yacht design package, please contact us by email or fax. YCA (HK) Ltd. is pleased to offer another great design by Gino Gandino’s Design Team, in Buenos Aries. 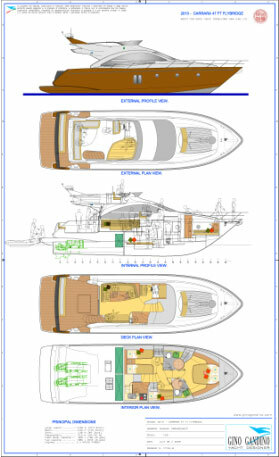 As you can see by the preliminary General Arrangements and Renderings below, the New Concept 47’ design package, offers modern European Styling, a well thought out Interior Arrangement, and tooling detail that will “fast forward” your production and Marketing abilities. This design package will require 4-5 months to complete, but offers the maximum in a cosmetic design and equipment selection opportunity, for the buyer. Engine: 2 X Volvo IPS600. Still in the design stage, New Concept 47’ awaits final input from its future builder for some cosmetic details, or the OK to proceed as is! 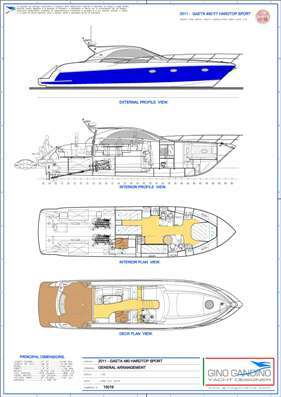 For further general information or terms regarding EXCLUSIVE ownership of 2011- New Concept 47’ Motor Yacht design package, please contact us by e mail or fax. 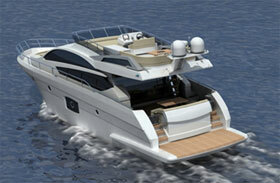 YCA (HK) Ltd. is pleased to offer this remarkable new design by the Gino Gandino Design Team. 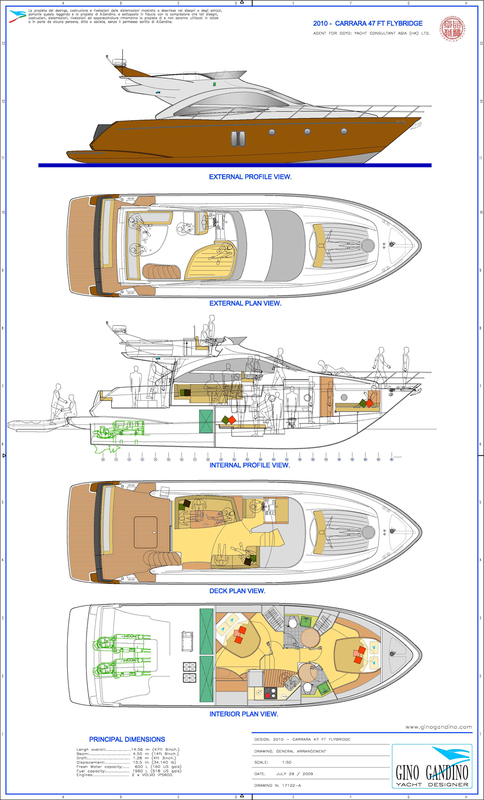 As you can see by the Profiles and General Arrangements below, the NEPTUNO 42’ HARDTOP design package offers modern European Styling and luxurious comfort, and protection from the elements when needed. The 2010 NEPTUNO 42’ offers creative use of a much larger interior space, adding a well thought out covered Hardtop Arrangement. We feel this vessel is well suited for any market region. This drawings package offers a very high level of detail that that will enhance your Production and Marketing abilities. Spacious Step down Galley with Upper and Lower cabinetry and appliances. Stbd. Side L shaped Salon Settee. Spacious Cockpit/ Entertainment area with table and wet bar available. Walk around side decks for easy access everywhere. 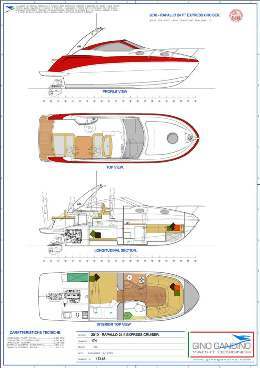 Still in the preliminary design stage, the Neptuno 42’ Hardtop Sport would enjoy final input from its future builder for some branding or cosmetic details, or the OK to proceed just as she is! 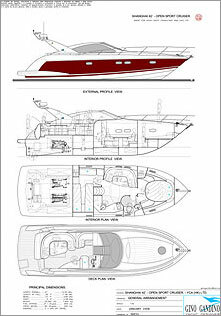 For further general information or terms regarding EXCLUSIVE use of The Neptuno 42' Hardtop Sport design package, please contact us by e mail or fax. 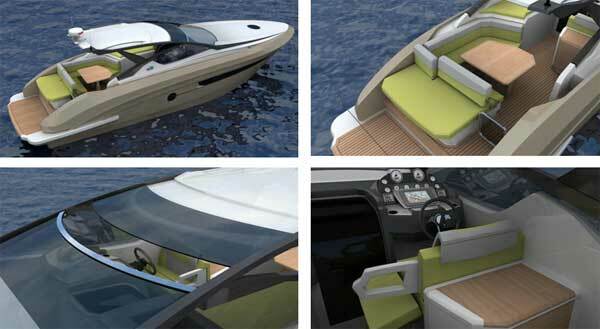 The Shanghai 42' (12.52 meter) Open Sports Cruiser. 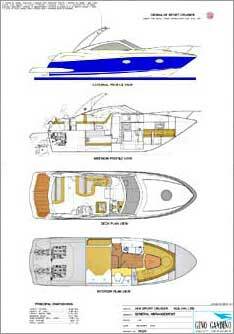 This Gino Gandino Yacht Design / Yacht Consultants Asia (HK) Ltd. complete design package is professionally designed and engineered for Euro styling and optimum "tunnel hull" performance. As with our other "turnkey" design and engineering packages, it represents a valuable opportunity to any yacht manufacturing company or individual, seriously interested in developing or increasing a high quality YACHT product line. The total design has just been completed and available now, allowing marketing, estimating, procurement and production to start immediately. 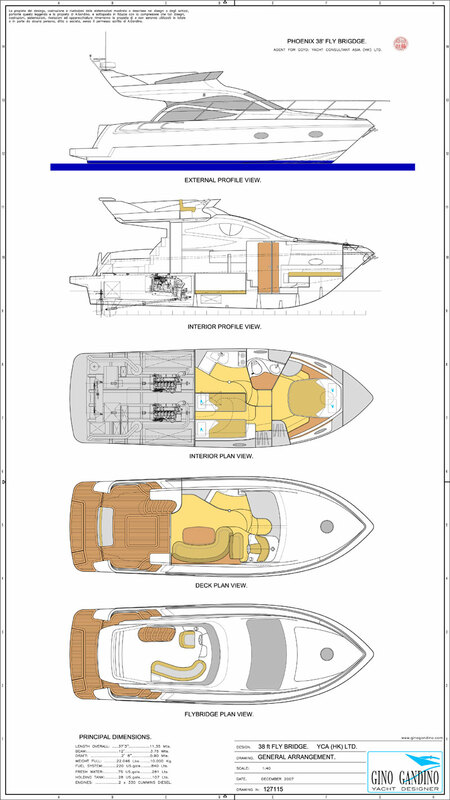 AutoCAD and Rhino Drawings are available on CD-Rom, ready for your plotter. 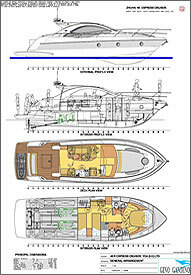 .65 meter (1:19) scale, professionally built FRP Yacht Model included. 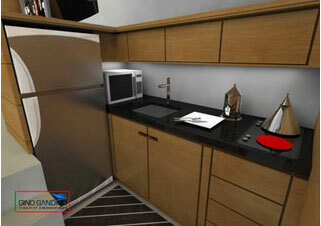 High quality marketing Renderings are included. 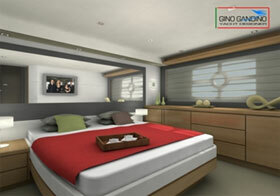 Ongoing support from Yacht Consultants Asia (HK) Ltd and Gino Gandino Yacht Designer is available, as an Option. Please contact us for a Microsoft Power Point Presentation of the Shanghai 42' Open Sports Cruiser, available in English or Chinese. 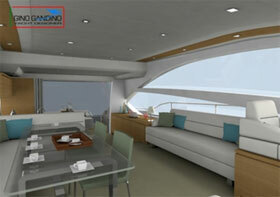 YCA (HK) Ltd. is pleased to offer this freshly updated design by Italian Gino Gandino Yacht Design. As you can see by the preliminary Profiles and General Arrangements below, the CATANIA 42’ Open Motor Yacht offers modern the very latest in European Styling, and a very well thought out Interior. L Shaped Settee (Nav. Station. 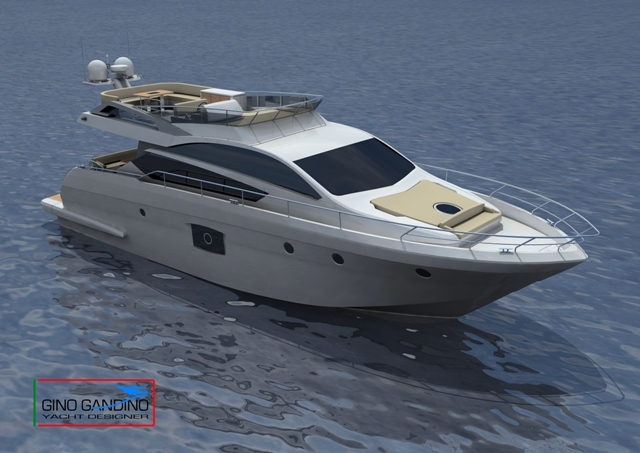 Still in the preliminary design stage, the Catania 42’ Open Motor Yacht would enjoy final input from its future builder for some branding or cosmetic details, or the OK to proceed just as she is! 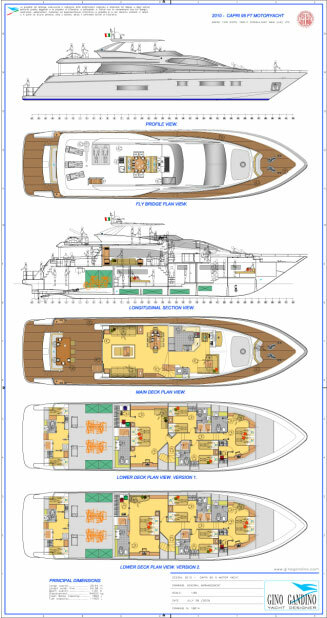 For further general information or terms regarding EXCLUSIVE use of The 2010 Catania 42' (12.52m) Open Motor Yacht design package, please contact us by e mail or fax. 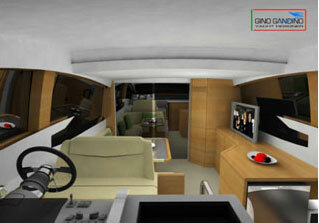 We are pleased to offer this new design by Gino Gandino Yacht Design (Italy). 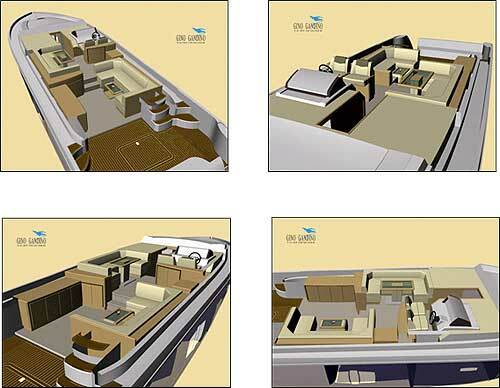 As you can see by the optional preliminary General Arrangements and renderings below, the Zhuhai 40' Express Cruiser offers highly desirable modern European Styling, well thought out interior arrangement, and exterior planning. This original design package will require 4-5 months to complete, offering the buyer maximum input from a cosmetic design and equipment selection opportunity. 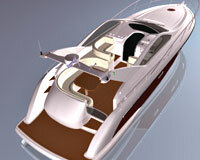 This design package can be completed and ready for Yacht production within 4-5 months. 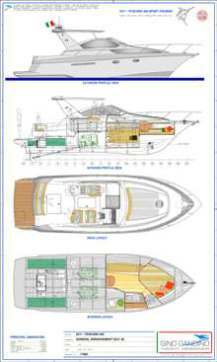 For further general information or terms regarding EXCLUSIVE ownership of The Zhuhai 40' Express Cruiser design package, please contact us by e mail or fax. YCA (HK) Ltd. is pleased to offer a very special design by Gino Gandino's Design Team, in Buenos Aries. 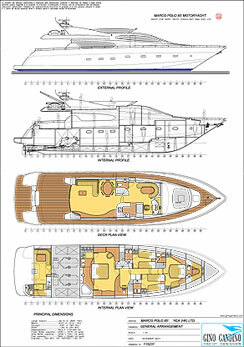 As you can see by the preliminary General Arrangements and Renderings below, the 12.2 m design package, offers "state of the art" modern European Styling, with well thought out Interior Arrangements... with the ability or option to create custom arrangements and specific equipment selections, at your request. Although the complete design package will require 6-8 months to complete, lines and tooling detail can be available very soon, thereby "fast forwarding" your Production and Marketing abilities. Although fully designed, the Cagliari 13.8 Meter (40 ft) Fly Bridge Motor Yacht awaits final input from its future builder for some cosmetic or additional optional details, or is OK to proceed as is in this Standard Version. Marketing and Purchasing departments can be start immediately. This full design package is complete and ready to put onto the production floor. 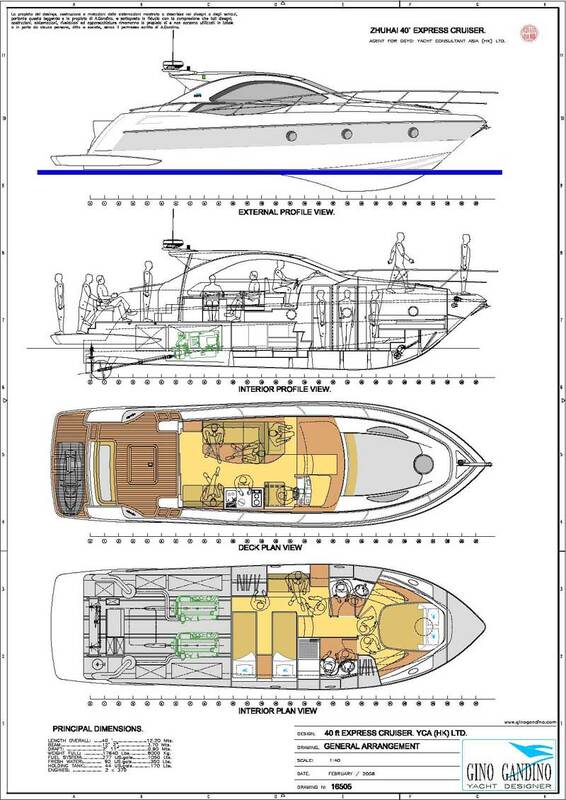 For further information or terms regarding GLOBAL EXCLUSIVITY of the 2012 - Cagliari 13.8 Meter (40 ft) Fly Bridge Motor Yacht design package , please contact us by e mail or fax. Still in the design stage, the San Remo 39ft awaits final input from its future builder for some cosmetic details, or the OK to proceed as is! 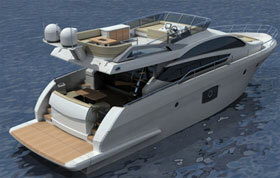 This base design package can be ready to start Yacht production within 1 month and will be completed in 5-6 months. 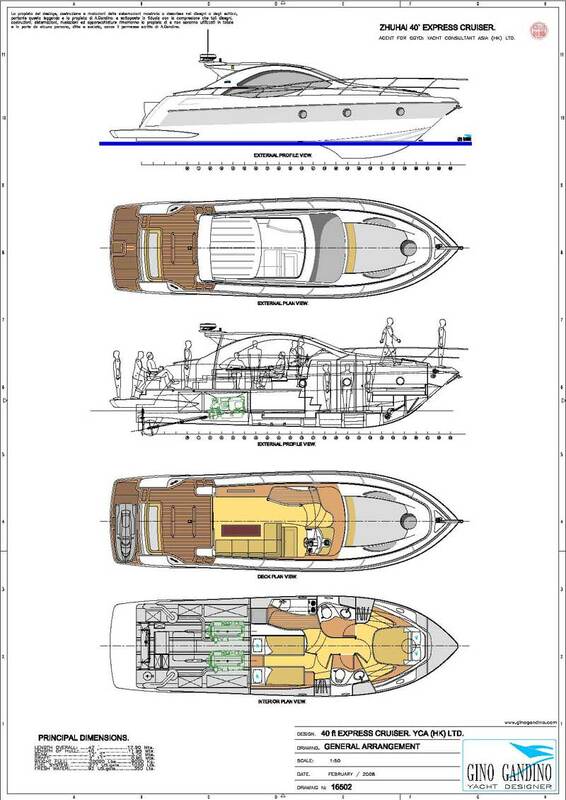 For further general information or terms regarding EXCLUSIVE ownership of 2012-San Remo 39ft Sport Motor Yacht design package, please contact us by e mail or fax. 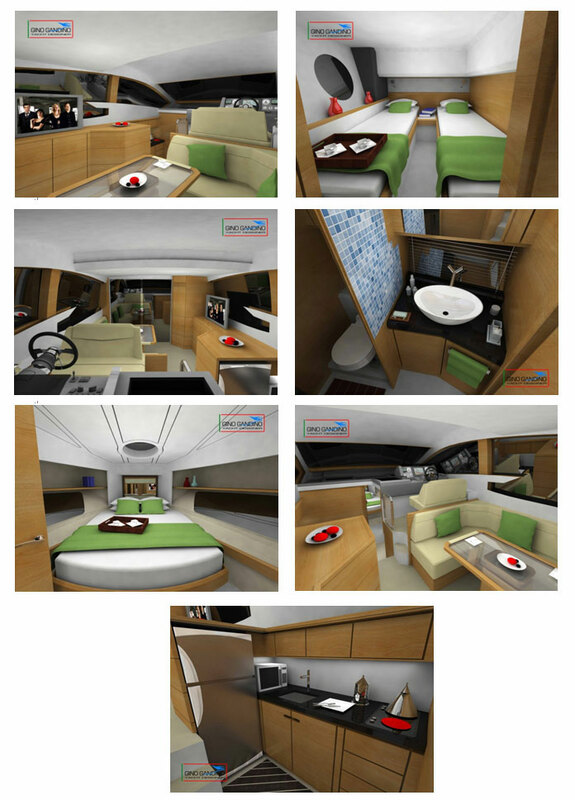 This Gino Gandino Yacht Design / Yacht Consultants Asia (HK) Ltd. design package is professionally designed and engineered for Euro styling and optimum performance. 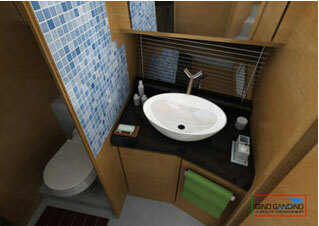 This design meets RINA and CE approvals allowing extended (International) marketing capabilities. As with our other "turnkey" design and engineering packages, this design will represent a valuable opportunity to any yacht manufacturing company or individual, seriously interested in developing or increasing a high quality YACHT or product line. The total design has not been completed, allowing further input from the builder. Engines: 2 * Volvo Penta D6-330 / 370 DP. Still in the design stage, the Haikou380 Open Sports Yacht awaits final input from its future builder for some cosmetic details, or the OK to proceed as is! 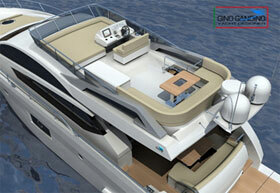 We are pleased to offer this new design by Gino Gandino Yacht Design (Italy). As you can see by the optional preliminary General Arrangements and renderings below, the HAIKOU 380 Hardtop Motor Yacht offers highly desirable modern European Styling, well thought out interior arrangement, and exterior planning. 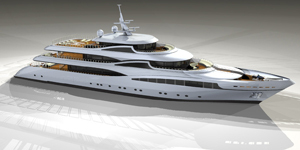 This design meets RINA and CE approvals allowing extended (International) marketing and technical acceptance, as well the ability to build a unique world class yacht in terms of styling. Being a completely new design package, it will require 6-7 months to complete, GGYD offers the buyer maximum input from a cosmetic design and equipment selection opportunity, should he chose. 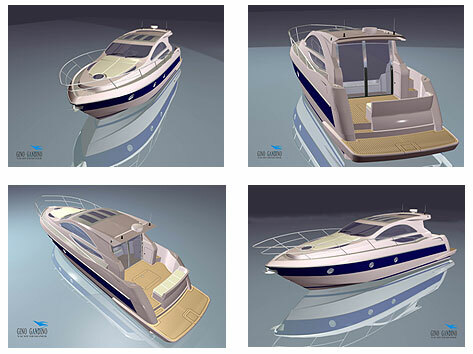 Still in the design stage, the Haikou380 Open Sports Yacht awaits final input from its future builder for some cosmetic details, or the OK to proceed as is!This design package can be completed and ready for Yacht production within 6-7 months. 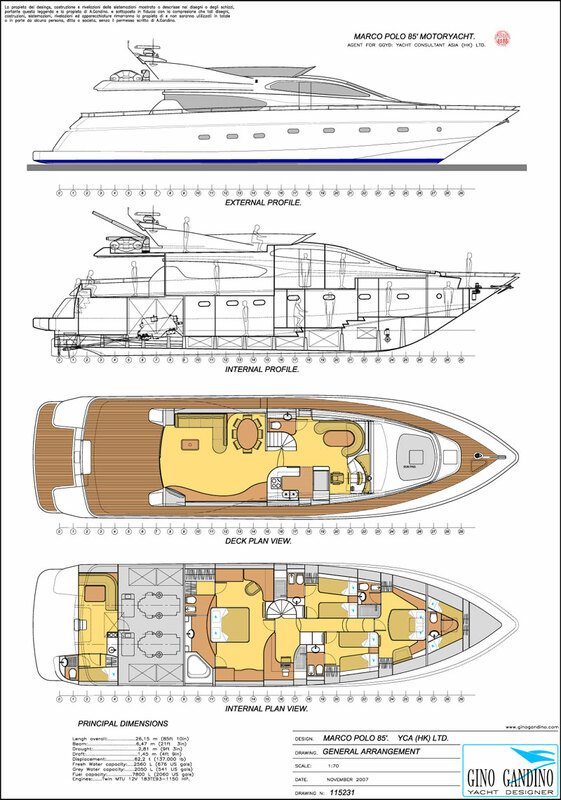 For further information or terms regarding EXCLUSIVE or Non Exclusive ownership of the HAIKOU 380 Hardtop Motor Yacht design package, please contact us by e mail or fax. The Phoenix 38' (11.35 meter ) Fly Bridge. As a collaborative effort between Yacht Consultants Asia (HK) Ltd. and Gino Gandino Yacht Design, we are offering this completed Yacht design package, designed and engineered to a high standard. This drawing package will allow you to start marketing, estimating, procurement and production immediately. Length Overall: 11.35 m (37 ft 3 in). 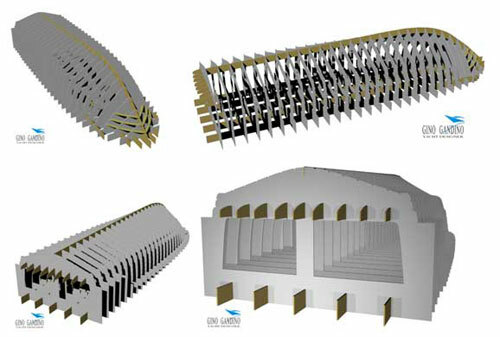 Over 60 AutoCAD Drawings available on CD-Rom, ready for your plotter. (1:15) scale, professionally built FRP Yacht Model included. Optional "Open Deck" arrangement available at extra cost. 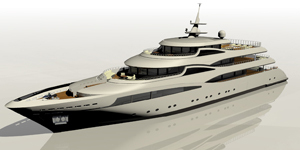 Ongoing Marketing, Technical and Production support from Yacht Consultants Asia (HK) Ltd and Gino Gandino Yacht Designer is available, as an Option. 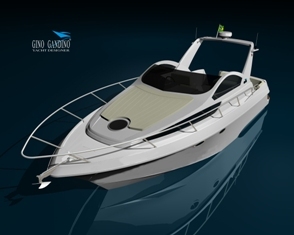 This new Gino Gandino Yacht Design / Yacht Consultants Asia (HK) Ltd. design package is professionally designed and engineered for Euro styling and optimum performance. 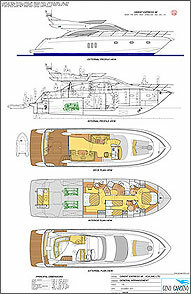 Exact in exterior styling with only interiors varying, both Gas are designed with purpose in mind, The Cruiser version offers a large permanent double berth forward and comfortable and dedicated saloon on the port side below, while the Sports version offers a comfortable dining table/settee forward which converts to a double berth for comfortable sleeping. In typical GGYD/YCA fashion these vessels are designed to RINA standard and CE Approval, providing every opportunity for you to build a genuinely high quality vessel. 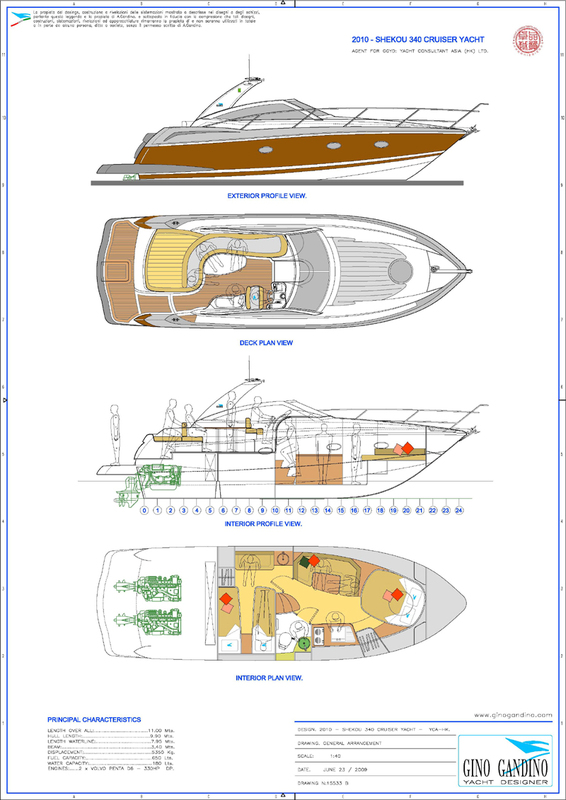 As with our other "turnkey" design and engineering packages, the SHEKOU 340 represents a valuable opportunity to any yacht manufacturing company or individual, seriously interested in developing a high quality YACHT product line. 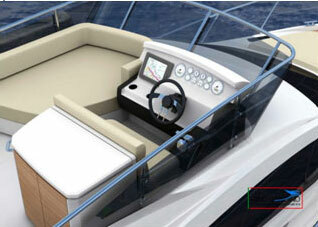 √ Engines: 2 * Volvo Penta D6 - 330HP DP. Note: Pricing includes choice of one of either interiors only with the 2nd interior plan Option available as an added cost. 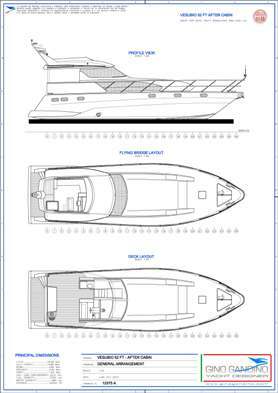 For further information or terms regarding EXCLUSIVE or NON EXCLUSIVE ownership of either of these new SHEKOU 340 Open Motor Yacht design packages, please contact us by e mail or fax. YCA (HK) Ltd. is pleased to offer another great design by Gino Gandino’s Design Team, in Buenos Aries. 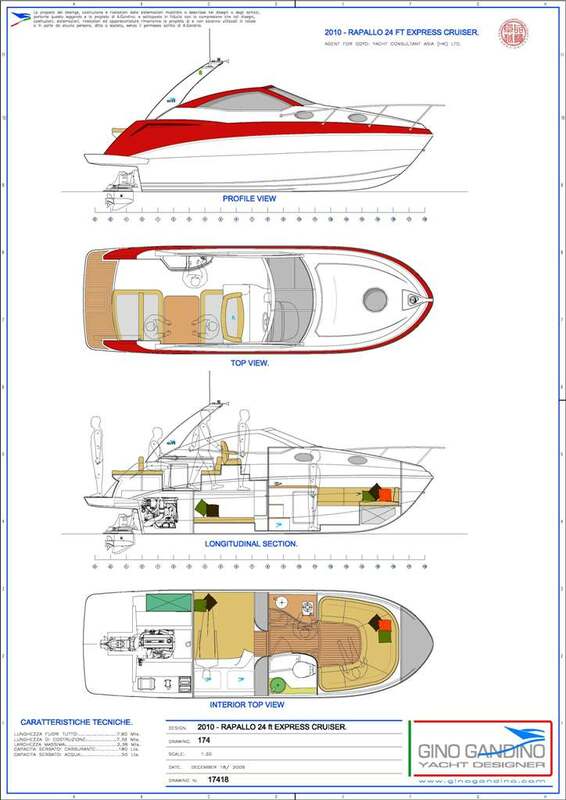 As you can see by the preliminary General Arrangements and Renderings below, the Pescara 340 design package, offers modern European Styling, a well thought out Interior Arrangement, and tooling detail that will “fast forward” your production and Marketing abilities. Still in the design stage, the Pescara 340 awaits final input from its future builder for some cosmetic details, or the OK to proceed as is! 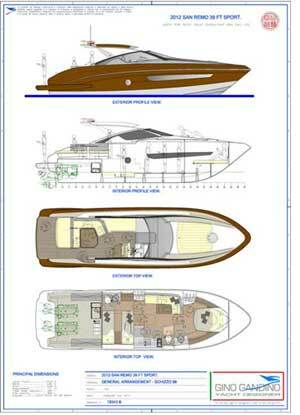 For further general information or terms regarding EXCLUSIVE ownership of 2011-Pescara 34' Sport Cruiser design package, please contact us by e mail or fax. This remarkable new design by the Gino Gandino Design Team. 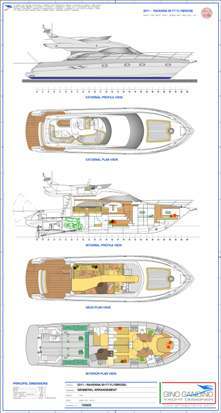 As you can see by the Profiles and General Arrangements below, the PALERMO 28’ design package offers the most modern Euro Styling and sensible comfort. The 2010 Palermo 28’ offers creative use of the interior space, adding a well thought out partially covered Open Deck Arrangement. 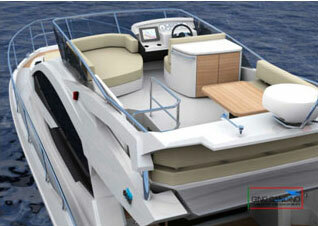 We feel this vessel is perfectly suited for the Middle East Gulf and south Asian lakes, rivers and coastal waters.. This boat is cost effective and easy to build, using twin out board motors for propulsion. Port and Starboard drop down boarding gates are very unique. Still in the design stage, the 2010 Palermo 28’ invites final input from its future builder for some cosmetic details, or the OK to proceed as is! 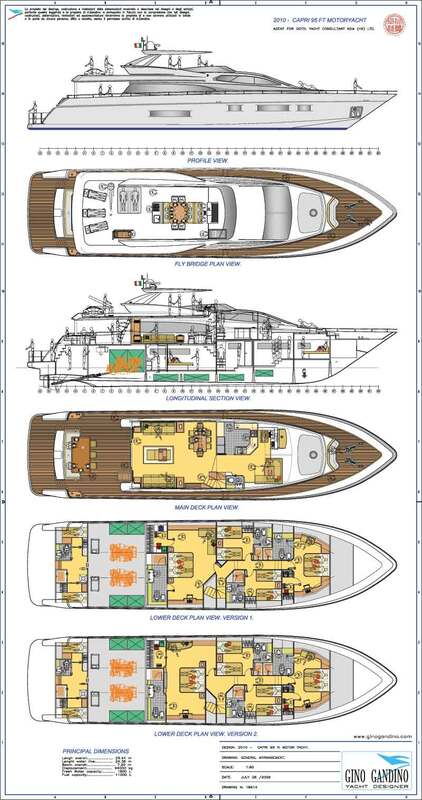 For further general information or terms regarding EXCLUSIVE use of The 2010 Palermo 28’ Cruiser CC design package, please contact us by e mail or fax. 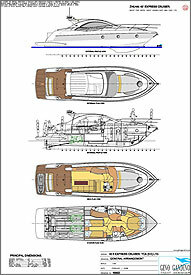 Over 75 AutoCAD Drawings available on CD-Rom, ready for your plotter. 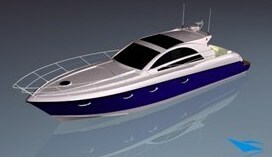 Professionally built FRP Yacht Model (Scale 1:13) included. Several high quality renderings, ready for marketing are included. 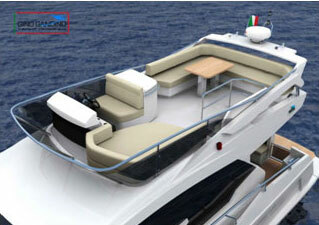 YCA (HK) Ltd. is pleased to offer another great design by Gino Gandino Yacht Design (Italy). 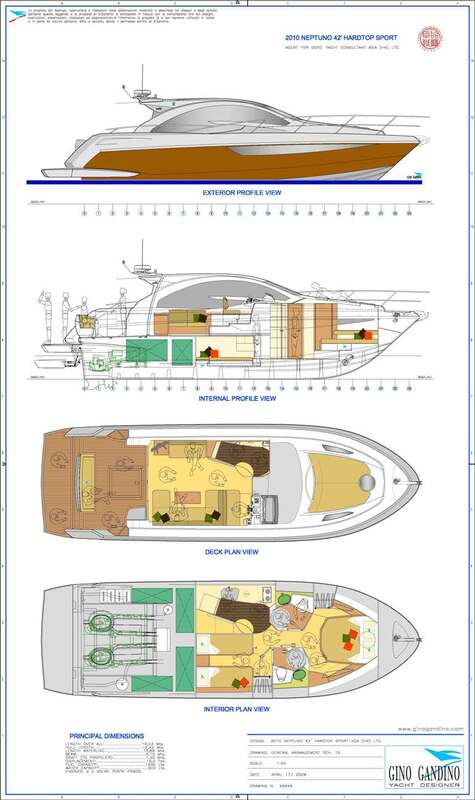 As you can see by the preliminary General Arrangements below, the Rapallo 24' Express Cruiser design package, offers modern European Styling, a well thought out Interior Arrangement, and design detail that will "fast forward" your production and Marketing abilities. This design package will require 3-4 months to complete, but offers the maximum in a cosmetic design and equipment selection opportunity, for the buyer. 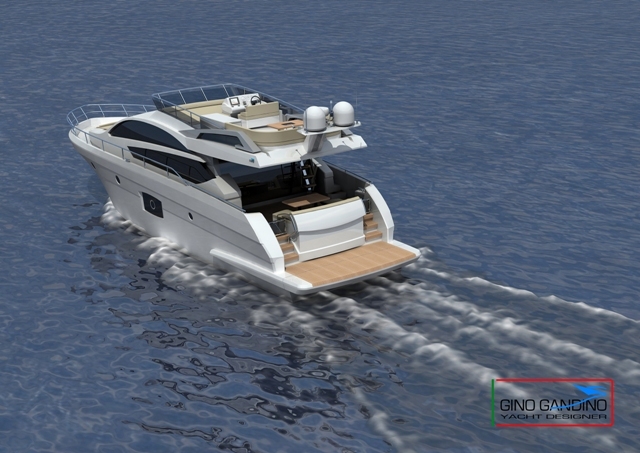 Still in the design stage, the Rapallo 24' Express Cruiser awaits final input from its future builder for some cosmetic details, or the OK to proceed as is! 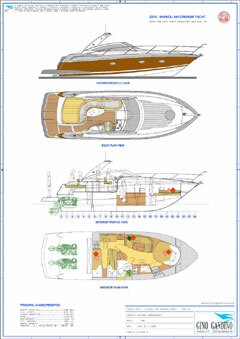 This design package can be completed and ready for Yacht production within 3-4 months. 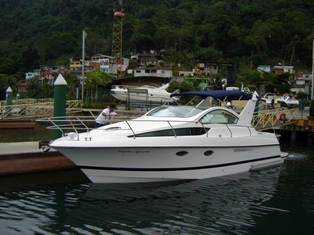 For further general information or terms regarding EXCLUSIVE ownership Rapallo 24' Express Cruiser design package, please contact us by e mail or fax.